On the first day of our company retreat in Japan, the Tofugu team went out to dinner in Ginza, Tokyo. After our meal, Koichi, Viet, Aya, Jamal, and I wanted to stay out later… jet lag be damned. On Viet's recommendation, we headed to a tiny establishment with a giant reputation: Bar Orchard. Bar Orchard often pops up on lists of "Best Bars in Tokyo" and "Best Bars in Asia." It reflects years of hard work by owners Miyanohara Takuo and his wife, Sumire. Their story goes like this: all his life, Takuo had wanted to be a bartender. 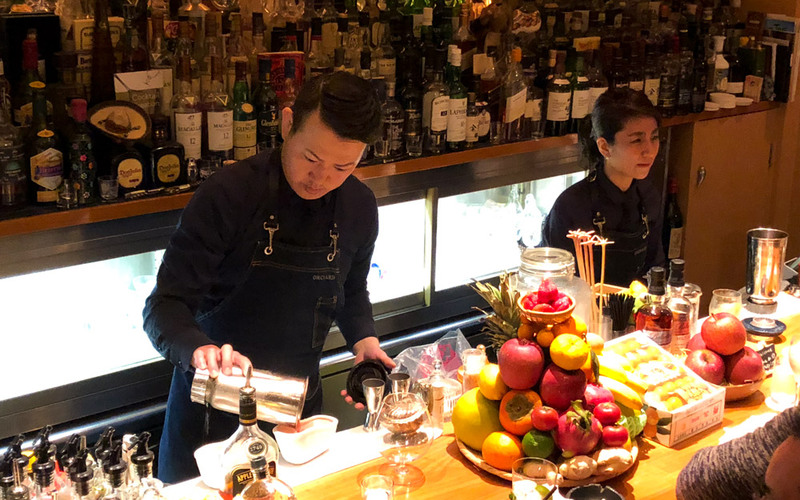 It was a profession that isn't exactly encouraged in Japan, but he kept at it, training first as a sommelier at the Hotel Okura Kobe and then working extra shifts behind the bar to learn the trade. Concurrently he was developing what would eventually become his signature creations: cocktails made with fresh fruit. 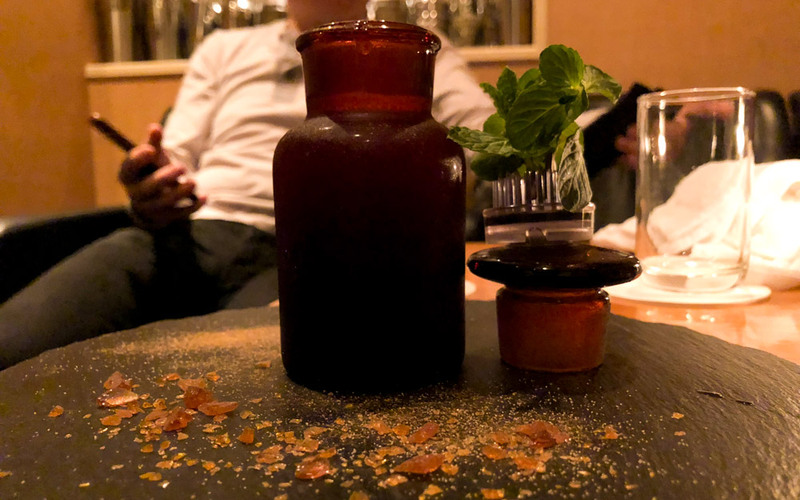 This was in the early 2000s, when classic drinks were all the rage, but he persevered, perfecting his concoctions and serving them to Okura's waitstaff, who loved them and recommended them to their customers. 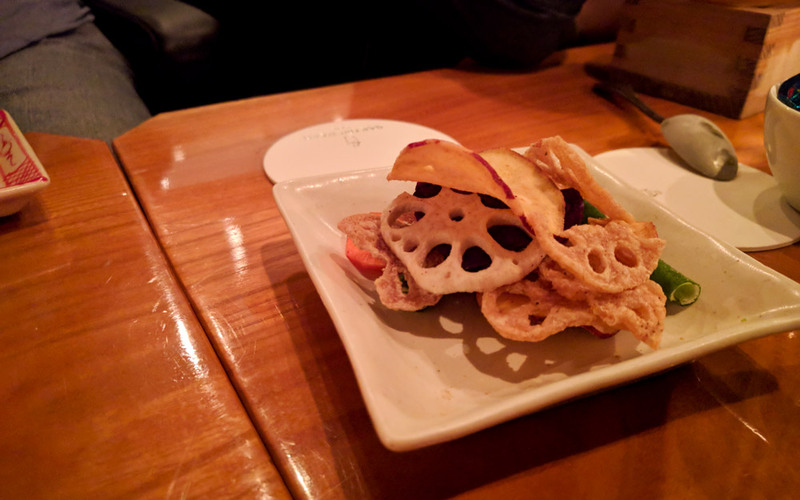 Sumire pointed out the mountain of fruit on display at the bar: apples, oranges, and berries, but also dragon fruit, yuzu, persimmons, lychees and more—it was an amazing collection. His fanbase grew, and it wasn't long before Takuo was winning bartending competitions and awards. But he had a second goal: he and Sumire, a bartender herself, dreamed of opening a cocktail bar in Ginza, the most competitive place for bartenders in all of Japan. If they wanted to be the best, they would have to prove it in ritzy Ginza. And so, in 2007, he and Sumire opened Bar Orchard, specializing in original, dazzlingly creative cocktails. And here we were, some of us for the first time, stepping from a tiny elevator into a beautiful room that barely held fifteen people. Luckily, a large group was leaving, so we got seated right away. The lighting at Bar Orchard was soft, giving the room a relaxed atmosphere. Behind the bar, Takuo was busy mixing drinks for the swanky dudes and dames nearby, while Sumire took orders from those of us sitting at tables. Sumire pointed out the mountain of fruit on display at the bar: apples, oranges, and berries, but also dragon fruit, yuzu, persimmons, lychees and more—it was an amazing collection. She invited us not only to choose the fruit for our drink, but also to choose its strength, too. Then Takuo would create a cocktail based on those choices. I never know what to order at a bar—I'm not big on booze—but I know what kind of fruit I like, which made ordering a yuzu cocktail easy. (Yuzu is a sour Japanese citrus fruit, with a taste that's a cross between a grapefruit and a lime.) The rest of the group ordered cocktails made from ginger, strawberry, and dragon fruit. After taking our order, Sumire brought back a plate of otōshi—an appetizer plate served at drinking establishments in Japan—of dried, salted Japanese vegetables. The lotus root was my favorite, but all the veggies were a perfect accompaniment to Bar Orchard's classy atmosphere. Little did I know it was about to get classier. 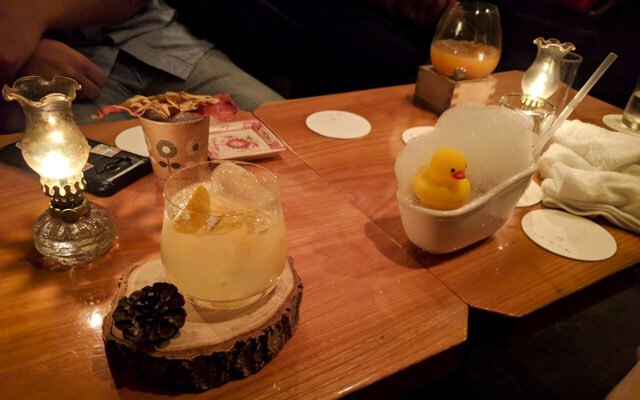 What I received instead was a vodka-based cocktail filled with big pieces of yuzu, served in a glass that sat on a slice of tree trunk with a smoldering pine cone perched on the side. Sumire explained I should inhale the pine smoke as I drank. This gave the drink a smoky flavor that went perfectly with the yuzu's sweet and sour taste. It was one of the most delicious drinks I'd ever had! As much as I loved how swanky the drink was, I was even more impressed by its creativity. I'd never had anything like it. 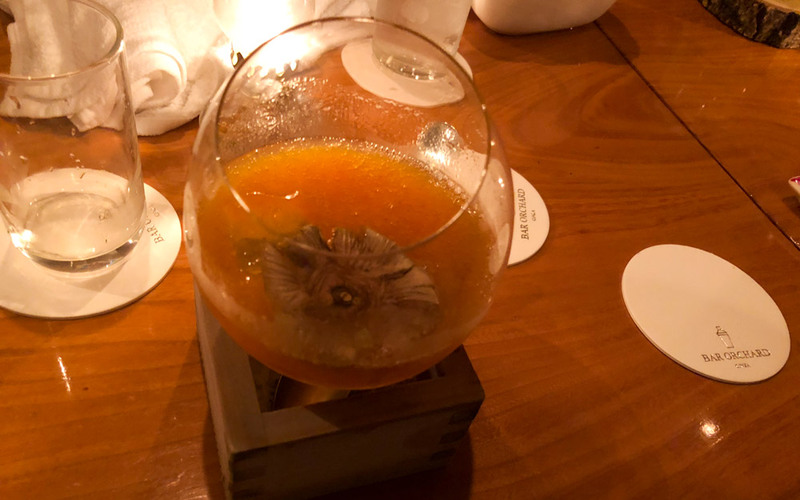 The creativity didn't stop there: Koichi's persimmon cocktail was served on top of a masu, a wooden box used for drinking sake. Inside was a smear of dry-ice ice cream. Koichi used his spoon to chip some of it off and pop it in his mouth. "Ouch!" he exclaimed, before smiling and carving out another bite. Jamal's dragon fruit cocktail was served in a metal planter, garnished with a slice of bacon that was embedded with apple chips. 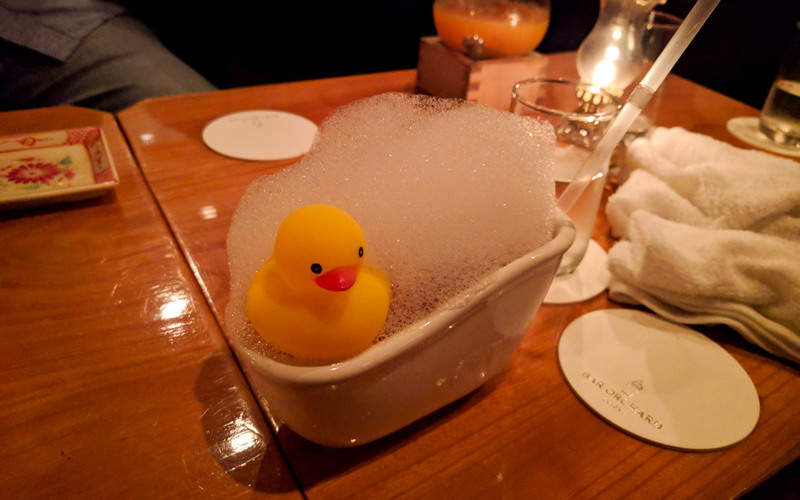 Viet and Aya both asked for a strawberry drink, which arrived in a tiny bathtub, topped with foamy bubbles and a rubber duckie. The foam was mildly salty and perfectly complemented the sweet drink. As much as I loved how swanky the drink was, I was even more impressed by its creativity. 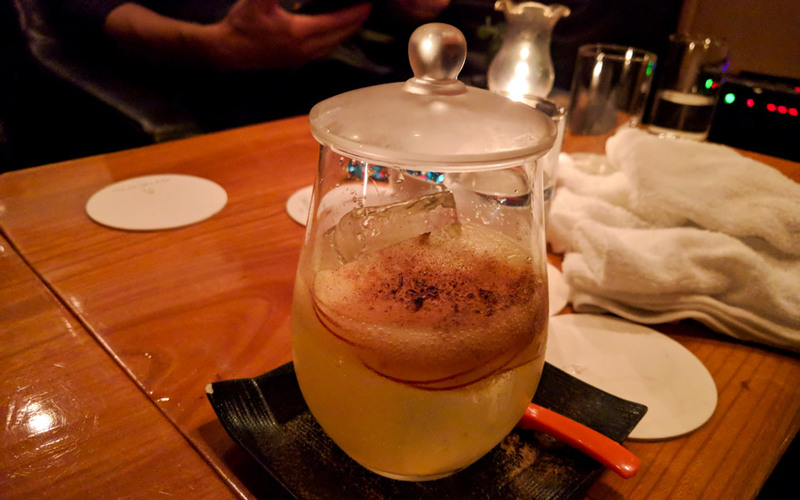 Besides innovative ingredients, Takuo and Sumire experiment with odd preparation methods like liquid nitrogen and other processes never before used in cocktails. Whatever they're doing, it's working. As we sipped, it was apparent that everyone loved what they ordered. Feeling tipsy and eager to try more, we ordered another round. For my second drink's fruit, I chose mikan, the tasty little oranges in season in winter. As you might expect, round two did not disappoint. 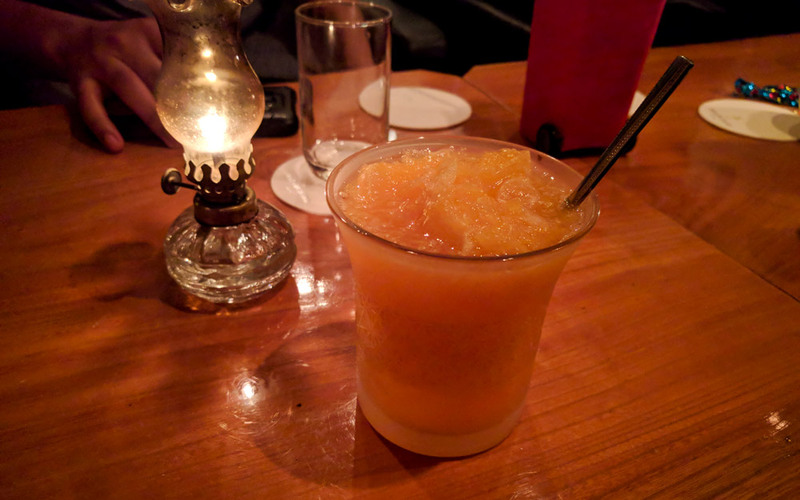 Once it arrived, my mikan cocktail rivaled the yuzu, bursting with orange-y flavor and offering a nice alcoholic punch at the end. I'm a big fan of pulpy orange juice, and this drink was pulp city. 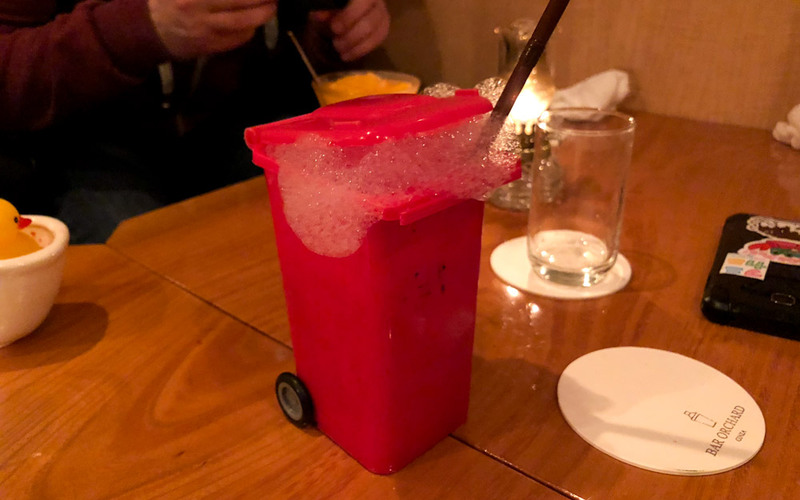 Jamal's second choice was strawberry, the same as Viet and Aya's, but instead of a bathtub, it came served in a miniature red trash can. It was weird and wonderful and just as delicious. Viet's second swig came in a little tin planter with a watering can clipped to the side. The drink had a green sprig sprouting from the ice, and its surface was dusted with matcha powder. We all agreed that its mix of bitter and sweet went well together. These cocktails weren't gimmicky. Every single item was masterfully crafted, and each drink's flavor exceeded our expectations. After two cocktails apiece, the alcohol and jet lag were hitting us hard, so instead of a third round, we opted to split one final drink between the five of us. To be honest, none of us remembers exactly what kind of fruit we ordered. Kumquats, perhaps? Who knows? All I remember is Koichi asking Sumire for the fruit that would give us "一番面白いやつ" (the most interesting one). A few minutes later, she arrived with a single black box. When we opened it, we found a bubbly potion and a brightly painted skull staring up at us. We pulled the vessel out and passed it around. 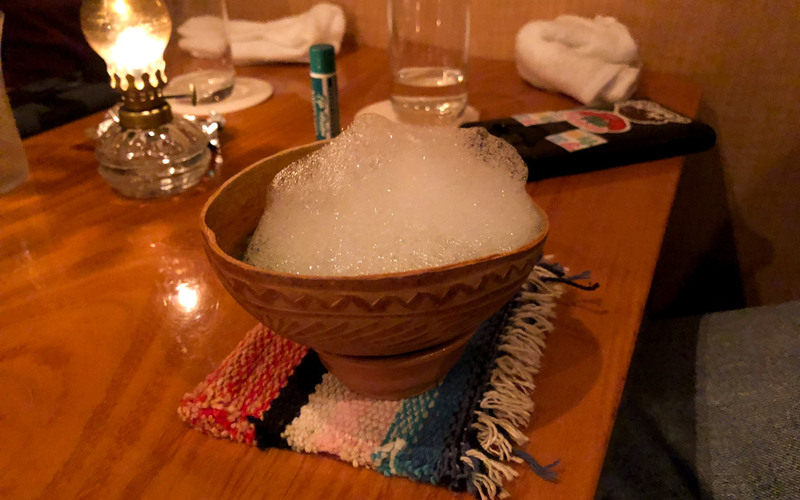 It contained a delicious tequila drink that also showcased some of the bubbly salt we'd enjoyed earlier. 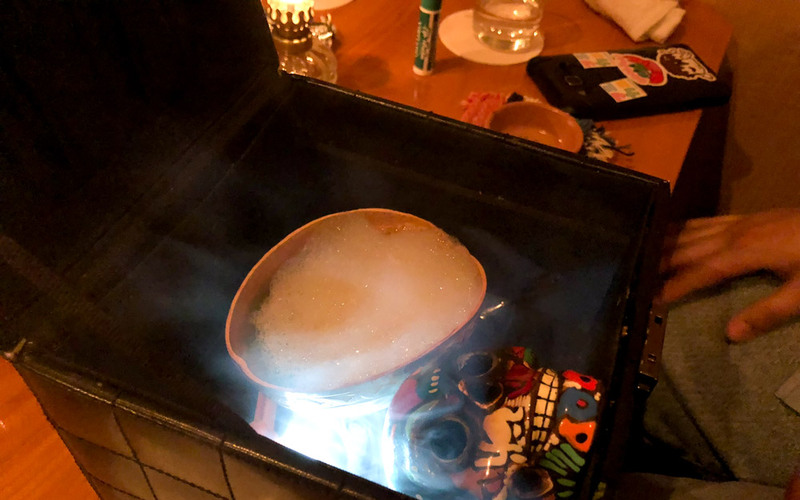 Even though some of us weren't big tequila fans, we all thought this strange and spooky cocktail was the perfect way to end our visit. Though we did our best to find one on our trip, no other cocktail bar came close to rivaling Bar Orchard. The space was cozy but not cramped; the low-key lighting and atmosphere was perfect for drinking with friends; and the drinks were some of the most delicious, most creative, and unique we'd ever had. Something special is going on at Bar Orchard. Takuyo and Sumire have clearly put years of thought and effort into its creation, from the decor to the presentation to the flavors inside each drink. They inject just enough playfulness to make it work. It's the simple things—a tiny trash can, a smoking pine cone—and whimsy is accomplished. Next time I find myself in Ginza, I'll definitely head back to Bar Orchard for a glass or two. If I'm with friends, I'll make it three. Thumbs up all the way. Bar Orchard might be my ideal bar: low-key, quiet, creative, and unique. The fruit cocktails were fantastic in taste and presentation. I would go out of my way to come back here again, even if I wasn’t near Ginza. Seeing pictures of the drinks, you’ll think this place is all gimmick and no depth. But, these cocktails had some of the most technical skill I’ve ever come across. It’s rare to find a place with such a combination of crazy presentation + skill all in one place. It’s one of the few bars worth going to on purpose, and I highly recommend you do. Thumbs up. 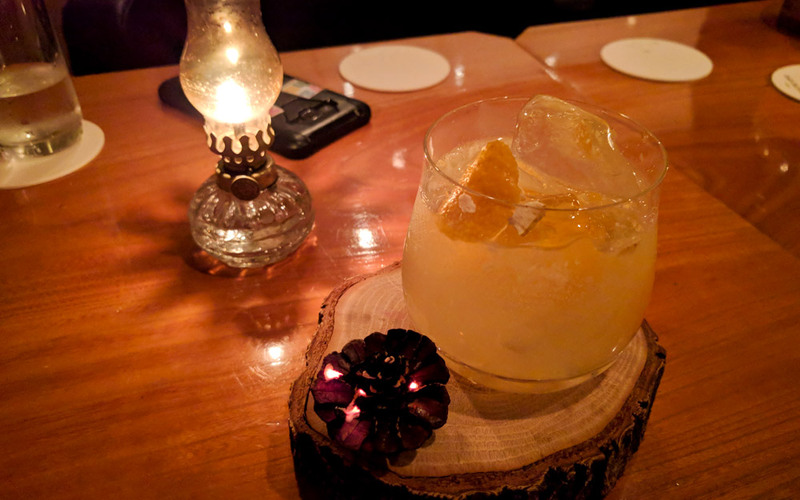 It was my first cocktail bar after arriving in Tokyo, and it did not disappoint. I was very impressed with how delicious everything was. Every drink they presented was unique, but it never felt like they were trying too hard to make it look wacky or whatever. I would come back with some friends in tow next time I’m in Tokyo, just to have that strawberry bathtub drink once again. One of the many things Ginza is known for is their cocktail bars. There is a variety to choose from, which can be very daunting. Bar Orchard claims to be the first cocktail bar in Tokyo to exclusively utilize fresh fruit for their cocktails. Whether this claim is true or not, who cares. I can undoubtedly say everything I had at this establishment was top notch. Fun cocktails. More importantly, they are delicious. The bartending couple is very nice and accommodating as well. The presentation was cool and the drinks weren’t bad, but I’m not really into fancy or expensive drinks. I enjoy cheap, sugary konbini drinks more than this place. If you want a place to chill after a meal and have a funny drink, it’s nice.